The Engulfing Candlestick Trade - How Reliable Is It? Reversal patterns are an important tool for timing the end of trend. One such pattern is the engulfing candlestick. The bullish engulfing pattern is typically a buy signal because it can potentially mean a bearish trend is turning upwards. Likewise a bearish engulfing candlestick can hint that a bullish trend is reversing. In order for any chart pattern to be useful we need to know its limitations. So in this article I’ll look at how reliable engulfing patterns are by testing on a group of forex pairs. What is an Engulfing Candle Pattern? Let’s first look at what an engulfing pattern looks like. A bearish engulfing candlestick is shown in the diagram below. It’s forms when the current candle completely “engulfs” the candle before it. By engulf that means the opening of the engulfing candle is at or above the previous close. And the close of the engulfing candle is below the open of the engulfed candle. The bullish engulfing candlestick is just the opposite of this. That means the engulfing candle is bullish and the engulfed candle is bearish. There are a variety of ways to separate weaker from stronger cases. With a stronger pattern, the engulfing candlestick can “engulf” multiple trailing candles. 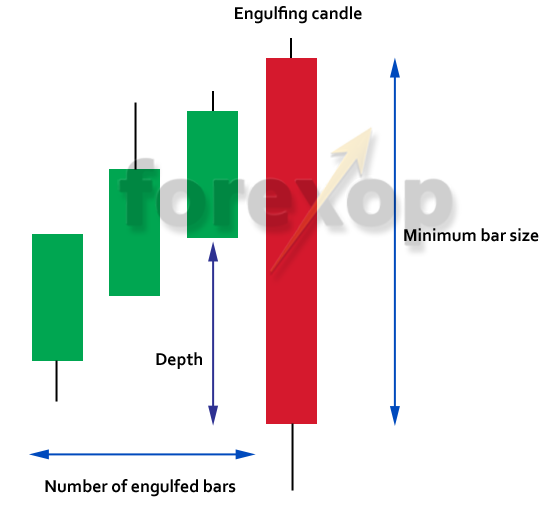 The length of the engulfing candle can also be used as a filter as can the “depth”. Smaller engulfing candles are seen as less likely to signal a strong reversal. Resistance and support areas are also useful in deciding which to trade and which to ignore. The question I am trying to answer here is how reliable are engulfing candles are as basic buy/sell signals. To do this I will look at the currency majors to find all engulfing patterns over a ten year period. I’ll then measure the market fall or rise if there was one just after the signal appeared. By doing this we will see if this pattern can be profitably traded – or if trading it is no better than flipping a coin. To start with I’ll define how I will measure the size of a market correction. To detect an engulfing candle, both the open and close levels must be known. In other words the candle must be complete. This means any detection will lag by one bar at least. 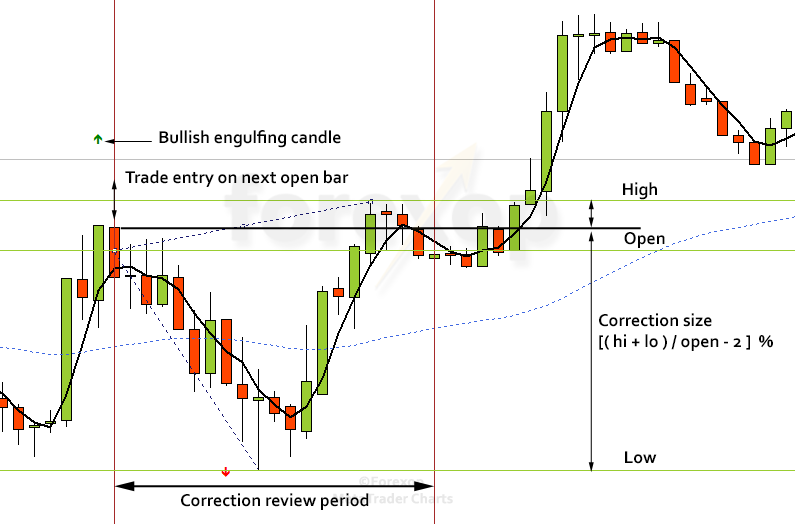 Therefore the earliest point at which a trade can be executed is at the open of the next bar. The “correction review period” is the number of bars ahead of the engulfing bar over which the correction is measured. The data covers a ten-year time period for the following currency pairs: USDJPY, EURUSD, GBPUSD, USDCHF, USDCAD, and AUDUSD. The results here are for the M5 chart (five minute bars) because it contains the most data. I did some tests on other time frames up to D1 with similar results. So the results I refer to below are for the five minute chart. There is a lot of variation over different time frames and currencies but here I just want to see the averages. The correction review period was 30 bars. I chose a narrow window to measure the correction size to make sure the effect was due to the engulfing candle and not some other event. The tests use a Metatrader engulfing bar detector to find the signals. You can freely download and use this indicator for yourself. I set the minimum threshold engulfing candle length to 40 points and I set the minimum number of “engulfed bars” to 1 bar and depth to zero. Again I played around with these settings but found similar results. So for the sake of brevity I haven’t included variations with different data or settings. I then aggregated all of the results into one data set covering the ten years’ worth of data for each pair. So the whole set includes over five million individual candle measurements. I include the random case so that the results of the engulfing patterns could be isolated from any background trending bias. 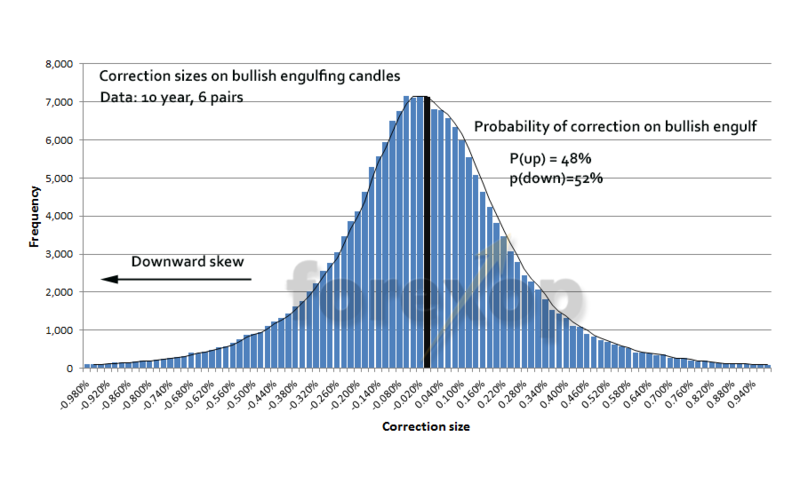 Figure 3 below shows the distribution of corrections following a random candle (case 0). The results are highly symmetrical and normally distributed. This is as expected. The black bar shows the zero point – correction size 0%. The price data does contain a very small downward trending bias (of 0.55%). That is 49.45% of randomly chosen candles were followed by upward corrections and 50.55% were followed by downward corrections. This is coincidental. There were more downward corrections than upward just because of the period that was covered and the currency pairs I looked at. So just by chance there would be a higher probability of picking a candle that resulted in a downward correction. This effect has to be removed. The results above show there was a 48% probability of an upward correction following a bullish engulfing pattern. There was a 52% probability of a downward correction following a bullish engulfing candle. For the bearish pattern, the situation was the reverse. 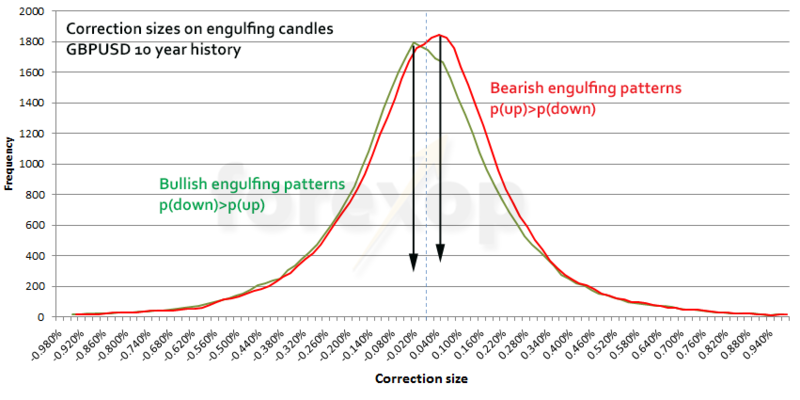 A bearish engulfing candle had a 51% probability of being followed by an upward correction and a 49% probability of being followed by a downward correction. The histograms for both cases are shown in Figures 4 and 5 below. Again the black bar shows the center line. The histogram for the bullish pattern is skewed to the left. This means a downward correction is more probable following this candle pattern. The histogram for the bearish pattern is the mirror image. It’s skewed to the right. This means an upward correction is more probable following the bearish engulfing candle. Based on this experiment, the bullish engulfing pattern seems to be a slightly stronger signal than the bearish. With both being contrarian. When looking at individual currency pairs the results were strong and consistent enough that this doesn’t seem to be fluke of the data. It doesn’t appear to be skewed by outliers. Some pairs were stronger and some weaker. But all pairs tested individually show the same result as the whole set. The table below shows the results for the bullish engulf pattern on specific currencies. With USDCAD for example there’s a 5.6% difference between the probability of a downward correction and an upward correction following the bullish candle pattern. The probability of a downward correction following the bullish candle was even higher. The table below shows the results for the bearish engulfing pattern on the respective currency pairs. Figure 6 below shows the two probability distributions for USDCAD overlaid on one another. The red line is for the bearish engulfing pattern and the green for the bullish engulfing pattern. It shows that an upward move is more likely following a bearish candle and a downward move is more likely following a bullish candle. The arrows show the two modal points for the two distributions. Figure 7 shows the same diagram but for GBPUSD. Again the result is broadly the same as it was for other currency pairs. All experiments I did showed a higher probability of the market moving in the opposition direction to that predicted. There weren’t any pairs or setups where the conventional trade worked. The stronger the engulfing signal, the more contrarian it was. At least to a point. So stronger patterns, as measured by size and depth, were more likely to signal trend continuation and not reversal. This might be because stronger ones tend to have more pullback just afterwards where the market gives up some of the move. The features of the candle itself don’t seem to be enough on their own. So when using engulfing patterns as buy/sell signals we need to use other confirmations as well. For example, it’s probably a good idea to combine the analysis with other techniques like trending and checking support and resistance lines. And possibly we should be looking at some engulfing candles not as signals of trend reversal but of trend continuation. You can download the engulfing bar detector here. Comment:Is it possible to start from 100€ to 1000€ in one trade ? 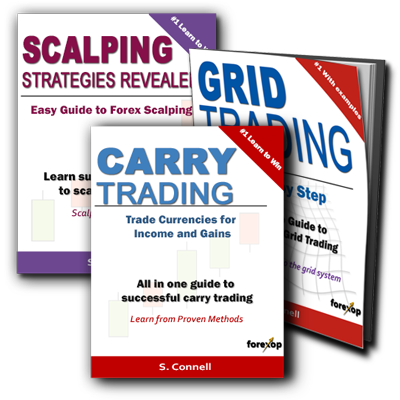 There are several ways to trade engulfing candles. Randomly trading them is potential for disaster to your account. But combing engulfing candles with patterns like double tops and double bottoms or reverse head and shoulders patterns may prove to increase your win rate slightly. Also consider the fact that your risk/reward plays a giant factor into how much money you can earn. Not entirely true. Whilst these results stand true for the lower timeframe, an engulfing candle works out nicely in 80% of the time on the D1 timeframe and more than 90% at the W1 timeframe. Odds are further enhanced if it occurs at a strong historic S/R line. Daily chart (D1) gives the same result; 51% to 49% probability that the move will go the other way (the wrong way). That’s on the same group of currency pairs and over the same period. Not enough data to test on weekly chart. That is doing a blind test and trading on every engulfing candle that appears. And I agree with you that trader discretion will likely enhance these results a fair bit. Nice work. We will have to see if the time length which the correction is checked make any difference to the result for example making it longer or shorter. Probably it won’t. I got similar result testing star candle patterns a while back now but did not find easy way to convert my finding into profits. Yes I know what you mean. In the tables I’ve only shown the difference between the up/down probabilities on the two sides. The difference between these probabilities can be big but that doesn’t necessarily mean that there’s a big asymmetric difference in upward and downward correction sizes. In fact it could be that the average difference is quite small. If the correction size difference is very small then it’s possible that profits would get erased through trading costs, spreads etc. There are several statistics to look at to get a better idea. For one you could look at how far the modal points are from the mid line. That would show where there are maximal asymmetric differences between the probabilities. I have Excel code to do it but didn’t display it here in the tables. Pretty analysis. About 5% difference seems to be more than enough to cover slippage and comission. Too good to be true. So I had to do my own test straight away. I’ve done the test on LMAX EURUSD historical tick data, from 2012. I’ve used my own C# testing app. My EURUSD results: bullish engulf, p (up) 49,97%, p (down) 50,03%. I’m so sad. Mandelbrot was right about technical analysis. That’s before any correction applied for background trending. I would like to check with some different broker data when I get time. Amazing! No wonder so many beginning forex traders lose money when they follow classical advice that is fundamentally flawed. 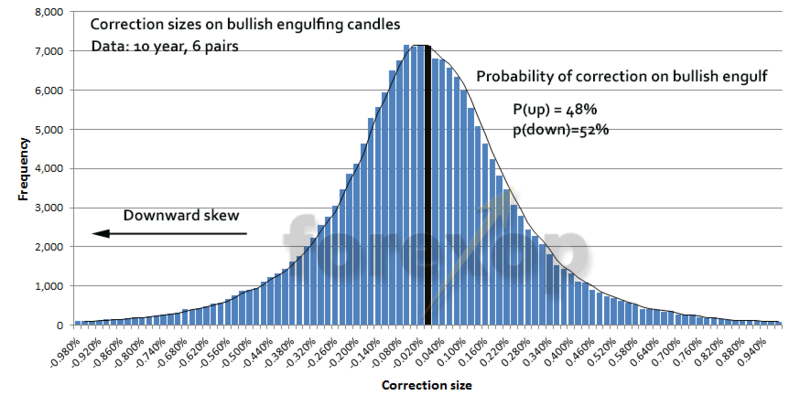 So, just to be clear – engulfing candles are CONTRARIAN indicators, with a 5-6% increased chance of correcting in the opposite direction to the engulfing candle? This basically makes engulfing candles a non-issue, non-pattern, doesn’t it? They have very little predictive effect. I’ve grown to appreciate the Parabolic SAR for detecting trend-changes, personally, but I’ve been experimenting to see how it can be improved with other indicators, like moving averages. This study does seem to confirm that. USDCAD gave the 5.6% increased probability towards the opposite move to the one expected. Some of the other crosses I looked at had bigger differences. Overall the difference was between 2% and 4% for the entire data set and all pairs showed a higher probability towards the opposite move. Maybe long ago you could have traded this candle pattern profitably the conventional way. But it’s so well known now among the masses that I expect any advantage there once was has disappeared. The other thing is that by time you can classify a candle as being engulfing often times most of move has already happened. That means there’s an increased chance of being caught in the retracement as the move corrects back the other way. I think that’s what happens in a lot of cases. This seems to be confirmed by the fact that the stronger engulfing candles do appear to be more contrarian. Love your analysis and insights. I am new to forexpo.com but now a big fan. I have found all of your articles to be of real value. Kudos and thanks! !